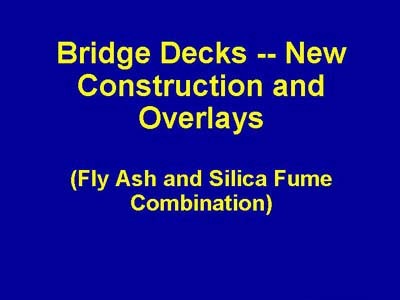 This section of the presentation shows how New York State DOT has addressed bridge deck construction for both new deck projects and for rehabilitation projects. Alampali, S., and Owens, F., "In-Service Performance of High-Performance Concrete Bridge Decks," Transportation Research Record 1696, Vol. 2, 2000, pp. 193-196. Alampali, S., and Owens, F., "Improved Performance of New York State Bridge Decks," HPC Bridge Views, No. 7, January/February, 2000, page 3. Streeter, D., "HPC in New York State Bridge Decks," HPC Bridge Views, No. 6, November/December, 1999, page 2.